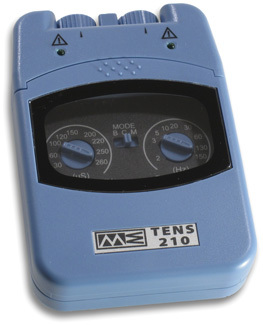 The TENS 210 is an affordable two-channel battery-operated TENS unit that provides continuous, modulated and burst modes. Pulse frequency and width may be set independently. Each unit comes with a carrying case, set of four V-Trode™ self-adhesive electrodes, a 9 volt battery and instructions. The TENS 210 is easy to use, light weight and high quality. Soft Mettler blue colors is a nice change from the typical black color of today’s TENS units. The blue color makes the 210 easy to see from across the room. Q: What is the difference between the 210 and the 210T? A: The 210T offers a timer and the 210 does not. Q: Can I do muscle re-education with the 210? A: Yes. However, it is not recommended for this use. A clinical unit is a much better option for you. Try the Trio Stim or the 226. Q: Is the 210 a good unit for pain management? A: Yes. TENS is specifically designed for pain management. Q: Can I use my 210 in combination with the Sonicator 740 ultrasound to perform combination therapy? A: Yes. Simply plug the 210 into the 740 using a pin to banana adapter and you will be able to perform combination therapy. Q: Does the 210 come with electrodes? A: Yes. The 210 comes complete with a carrying case, lead wires, battery, belt clip, V-Trode electrodes and an instruction manual. Q: What kind of electrodes will work best with the 210? A: The higher the quality of the electrode, the better the treatment. We recommend using either the Mettler EZ Trode or the Mettler V-trode line.